What is Summative Evaluation in Education? A summative evaluation is one that takes place at the end of the evaluation cycle. It is a type of evaluation that judges the worth of the task by the end of program activities. The main focus of summative evaluation is based on the outcome. Summative evaluations can also be mentioned as assessments which measure the outcome of individuals or students to estimate. Similarly in summative evaluation in education, we assess students what students have learned. By this way, they equate it with a standard benchmark. Few examples of summative forms of evaluation are final exams, chapter test, and large-scale standardization test such as SAT. While summative evaluation is an assessment done after the whole process is completed. The purpose of formative evaluation is to check whether your program is working effectively or not. However, formative evaluation and summative evaluation are complementary. Here are few elements you need to consider. Activities including Workshops, training programs, case management, etc. Summative Assessments are performed on periodic basis to recognize and determine what students actually know and what they do not know. This can be done through standardized tests such as state assessments and other. As mentioned earlier, formative assessment is the evaluation process which is done during the process, like improving the teaching technique, not limiting to only bookish knowledge etc. Here we will be discussing about the differences between formative and summative assessments. 1. Formative evaluation is an ongoing process, so it is performed during the process. Whereas summative evaluation is done only after the completion of process. 3. Formative evaluation process helps in improving student’s learning capacity or skill. Through summative evaluation, we can analyze the students achievements. 4. Formative evaluation deals with small areas of content as it an ongoing process. But summative evaluation deals with the whole project as it is performed after the completion. 5. Formative evaluation considers the assessment as a process. And summative evaluation are considered more of a product. There are numerous advantages when a summative evaluation is considered in the academic arena. A few of them are mentioned below. A summative evaluation follows certain strategies for evaluation by means of assignments, tests, projects and more. By these ways, the teacher can make out if the students have learned and understood the subject. An assignment is said to be a summative one by the way it is utilized and not by the design of the test, assignment or by self-evaluation. By this way, the instructor can make out to what degree the students have understood with the materials that have been taught. The usual procedure is that summative evaluations are done at the end of any instructional period. Thus, summative evaluation is considered to be evaluative in nature rather than being mentioned as diagnostic. The real meaning is that this evaluation is made used to find out the learning growth and attainment. They are also utilized to estimate the effectiveness of educational programs. Another key advantage is that they are utilized to measure the improvement towards objectives and goals. More over course-placement decisions are also made with summative evaluation. The results of summative evaluations are ones that are recorded as scores or grades into the students’ academic records. They can be in the format of test scores, letter grades or report cards which can be used in college admission process. Many schools, districts, and courses consider summative evaluation as a major parameter in the grading system. The presence of summative evaluation is a motivator as it assists the individuals and offers them an opportunity to develop a learning environment. This is an evaluation meant for learning and is based on the outcome. The outcome of the summative evaluation is considered as a boosting factor when it’s positive. With this type of evaluation, confidence is boosted and also they act as a springboard to certain behavior change at workplace or institution. With the help of summative evaluation results, trainers and instructors can find out weak areas where the results are steadily low. By this way, alternative methods can be utilized in order to improve the results. New training can be followed for future events focusing towards success. This type of evaluation helps in determining the success of methods used for training programs used. They are equated with others and evaluated. Summative evaluations are considered as tools, as they have the capability to evaluate the usefulness of any program, they work towards the improvement of the school or institution; they help in aligning curriculum and also helping students to get placed in the appropriate programs. They assist a lot as they offer a lot of information in classroom level. The other best advantage with summative evaluation is that they help in making instructional adjustments and interventions during the process of learning. The summative design is utilized as an evaluation technique in the course of instructional design. Depending on the intervention efficiency summative evaluation offers beneficial information. The value or worth of the intervention is judged by means of summative evaluation during the conclusion. With the help of summative evaluation, the supervisor can measure the educational faculty or the instructor. The level of performance of all the teachers, instructors can be measured by means of this evaluation. The school needs for teacher’s accountability is met by means of summative evaluation. The evaluation is carried out with a form which has checklist and few occasional narratives. Evaluation is also done on professionalism, classroom climate, planning, instruction, preparation and more. When the summative evaluation is considered at organizational levels, they take place at project implementation times and most often by the end of the project. They can also be referred as ex-post evaluation. This type of evaluation is linked with quantitative methods of data collection and more objective ones. They are associated with the evaluation drivers of accountability. Hence to gain a better understanding of the project, summative evaluation utilizes both quantitative and qualitative methods. This also helps individuals understand why and what has occurred. By employing qualitative methods for data collection, there is always a clear view of unintended consequences and ways for improvement. By following summative evaluation in organizations, the individuals can find out if their project has reached their goals and objectives planned for. The evaluation also helps to quantify changes in resource and also make use of attributable for the project. By this way, the impact of the project can be identified. The evaluation assists in comparing the impact of various projects which leads to result based decisions for further spending allocations. The evaluation also paves a way for better understanding of the changes that takes place in the project, they assist in finding out what would work and what does not. With all the advantages mentioned, there are few disadvantages which need to be focused on before opting for a summative evaluation. Few of them are mentioned below. It is mentioned that summative evaluation motivates individuals so that they put in more effort for their studies. When student motivation and its impact is reviewed, the evidence for policy and practice information and a coordinating center at the University of London found the relation that sustained between self-esteem and standardized tests. It was found that there prevailed a lower self-esteem by students who performed in a poor manner. This in turn, led them to put in less effort towards their studies and for their future academic progress. The main disadvantages of summative evaluation are that since it focuses on output at the end, in case there are hindrances or difficulties, learning process at the end can be tough. There is no chance to recover as the results are at the end. This is not an accurate reflection when learning is considered. Since it is being a single test at the end of the complete session of academics, it makes almost all individuals anxious and disruptive. They face the summative evaluation with nervousness and fear. Nothing is done to identify hindrances or challenges well in advance in a summative evaluation. Instructional issues are not identified until they blow up and become critical. When summative evaluation is considered, it focuses mainly on the performance of the teachers as they teach to the test. A simple example is that when any state level test focuses mainly on analogies and anagrams, students are interested in focusing and working on those exercises for hours. By this way, they divert from reading and writing or their vocabulary development. Overall it is concluded that summative evaluation isn’t perfect because even an outstanding student may face questions that may bring them down. The main reason for that would be that a student gets nervous or tensed due to pressure for exams. Hence, summative evaluation is not considered as the best reflection for learning. Repeated practice test for low-achieving students lowers their self-confidence and self-esteem. The summative evaluation results have a negative effect on low achievers when they are more pronounced for students than for schools or authorities. Secondary age low-achievers may perform in a worse manner as they are failing in the course of time. It is also considered as a limiting process for the more able individuals. Anxiety is another reason which is caused in big bang test especially amongst girls and leads to expanding the gap between higher and low achieving individuals. The extrinsic motivation which means that responding to some kind of reward is promoted in summative evaluation rather than intrinsic motivation which means that working for something they are interested and desire to work for. The instructors and teachers work towards the test and deviate themselves from curriculum and content. There can be chances for distortion in terms of teaching techniques. 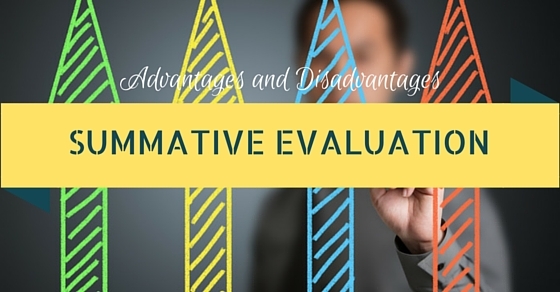 The other disadvantage is that summative evaluation questions may not be framed in a manner similar to formative evaluation. The instructors and teachers may themselves have to dedicate more time for summative evaluation which may not actually enhance individual’s knowledge. With all this, teachers also adopt some didactic teaching style which may not be perfect and comfortable for many students. The evaluation must be developed in a manner that covers and reflects that complete content and how the material has been taught. Tasks should also possess better consistency which is unavailable and the way they are marked internally and externally across various versions. Reliability and validity errors are few factors that must be focused on with summative evaluation as they measure students’ performance. Summative evaluations are considered to possess limited means of expression especially that standardized test which has a number of multiple choice questions for automatic grading. This has the main disadvantage for many students which can be non-native speakers with less knowledge of the language, there are students who face cultural barriers and may face difficulties in understanding the questions, and there may be students with physical or learning disabilities and pupils who give a poor performance due to pressure in the testing conditions. There are more chances that summative evaluation measures wrong aspects. Harvard University’s graduate school of education professor David Rose and the principal architect of universal design for learning suggest that the evaluation of students does not offer the right result or accurate information. Questions in the summative evaluation are asked in a manner where they do not understand or unable to answer. These aspects cannot judge if a student knows the subject or not.The above listed are few advantages and disadvantages of summative evaluation. Teachers and students should gain knowledge of these and try for new steps to avoid disadvantages in future. The above listed are few advantages and disadvantages of summative evaluation. Teachers and students should gain knowledge of these and try for new steps to avoid disadvantages in future.In order to improve summative evaluations and enhance learning process the teachers can follow a few hints. They can plan for a test after each learning session. By this way, the material and is covered and also a formative and summative evaluation of curriculum is done. Different kind of options for evaluation can be followed. When a standardized test or national tests are conducted, there is very little room for re-imagining. A long form test, a visual or audio presentation, an individual essay are few ways where students can explain the material in medium. By this way they are comfortable and teachers can also capture a picture of their understanding. Education can be moved out of classrooms by making them contact with real world application. By this way pressure and stigma is eradicated where they also temp to avoid plagiarize. In order to improve summative evaluations and enhance the learning process, the teachers can follow a few characteristics of summative assessment. They can plan for a test after each learning session. By this way, the material and curriculum are also covered. Different kind of options for evaluation can be followed. When a standardized test or national tests are conducted, there is very little room for re-imagining. A long form test, a visual or audio presentation, an individual essay are few ways where students can explain the material in the medium. By this way they are comfortable and teachers can also capture a picture of their understanding. Education can be moved out of classrooms by making them contact with real world application. By this way, pressure and stigma are eradicated where they also temp to avoid plagiarize. These few parameters and features about summative evaluation can be beneficial for all readers. The best shots are explained in detail which can be followed, without a doubt, also the disadvantages are to be learned in order to have knowledge of the same. The methods to adapt and rectify the cons are important to be followed to make summative evaluation a perfect one. Apart from these pointers, there are also many other sources which discuss the same about summative evaluations.